An outdoor kitchen is one of the coolest things to have outside your home, especially during the summer. It’s the perfect compliment to a pool and it makes grilling manly steaks, burgers and hot dogs that much better. 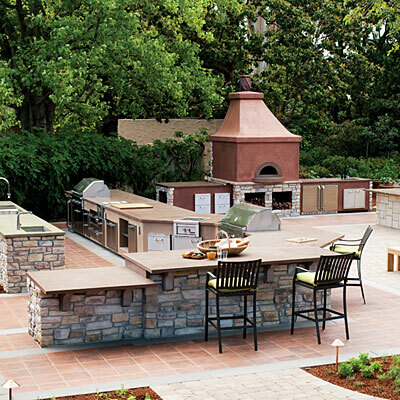 For those that have an outdoor kitchen already, I’ll be talking about some tips to sprucing up your outdoor kitchen. Almost anything that can be added to an indoor kitchen can be added to an outdoor kitchen. Anything from a refrigerator, to cabinets, to grills and sinks can be added; however, there must be something done to all of these additions: they must be made waterproof! Concerning the grill, you can have one custom made or you can pick out an already-made BBQ grill for a fairly reasonable price. Throw in some skewers and you’re all set. When you’re thinking about flooring options for an outdoor kitchen area, you need to pick an option that isn’t too slick so stay away from marble and tile floors for the outdoor kitchen area. You will also need to add storage areas and cabinet space, as well as counter top space. The most popular choices for the counter tops are either stone or brick counter tops. All the storage areas need to be waterproof so they can hold up in bad weather conditions. The best choice for storage space is stainless steel, since wood will rot. You may also purchase and overhead covering for your grill to make the grilling easier. For your sink, the best choices are stainless steel or ceramic and your home water supply can be connected to the outdoor sink or done so with a hose.